Bridgewater Bay Homes: Spacious remodeled 2 story house, with Master on the first floor, in a highly desired, A-rated school district, gated community in the heart of Naples. Bridgewater Bay offers a lot of amenities and social events for a low maintenance fee : Tennis, resort pool, lap pool, fitness center, sauna, event and meeting rooms, billiards, RV and boat parking lot available for owners. Quick drive to shopping, groceries, restaurants, movie theaters, philharmonic, and beaches. Bridgewater Bay Homes: If you are looking for an elegant 4 bedroom home in a gated community in the heart of North Naples, then Bridgewater Bay is the place for you. This light and airy courtyard home features 3 bedrooms, each with its own bath in the main area and a separate 1 bedroom Cabana with its own bath and wet bar. Here you will find a large gathering room, a separate formal living and dining room and a kitchen with beautiful wood cabinets, solid surface counters and stainless appliances. Features include tile on the diagonal in the living areas, plantation shutters and tray and volume ceilings throughout. The Cabana is perfect for an office or guests, parents or older child who need a little privacy and the brick paver courtyard is great for family gatherings. Bridgewater Bay features a 36,000 sq. ft. clubhouse with an event hall, meeting rooms, library, billiards, and fitness center with sauna and steam rooms. Outside you will find a large resort style pool and spa, separate lap pool, tennis, bocce, basketball courts, putting green, and children’s play areas with pickle ball coming this year. 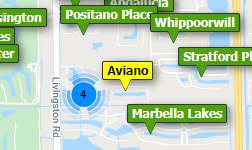 Bridgewater Bay is just a quick drive to Mercato, Vanderbilt Beach and all that Naples has to offer! Bridgewater Bay Homes: Experience this wonderful courtyard home. Perfect for families that like their privacy, or have parents that live with them. Highly desired school zone, low HOA fees. Bridgewater Bay is a well sought after location that is close to Naples shopping, restaurants and beaches! Gated community with numerous amenities including community pool, tennis, clubhouse, exercise facility and much more all in walking distance to this home. Beautiful grounds with many lakes and fountains to see. Pet friendly with approval. A/C, hot water heater new in past 3 years. Refrigerator and stove 1 year old. Need professional assistance selling your property at Bridgewater Bay Naples? Find out how an Area Specialist can help to generate more property exposure in order to get the most money for your investment in the least amount of time.